… that are NOT your typical 3D printer. Although 3D printers have received most of the buzz in recent months, these next-gen machines are doing much more than just spitting out ABS and PLA objects. In fact, you can expect to find one of the following 15 gadgets on your workbench, desktop, kitchen counter or inside your man cave in the not too distant future. A big hit at this year’s World Maker Faire, the Glowforge is a revolutionary 3D laser printer that uses subtractive technology rather than additive methods. With one press of a button, the device cuts and engraves a variety of materials — including wood, fabric, leather, paper, cardboard, food and acrylic — instead of constructing items layer by layer. During its crowdfunding campaign, the team impressively garnered a record-setting $27M in 30 days. With X-Carve, Inventables offers several new elements to the 3D carving kit concept which they’ve been associated with over the past few years. This customizable piece of equipment is ideal for the workshop, and can create precision parts from plastic, wood and metal. It comes in two sizes, 500mm and 1000mm rails, which provide a 12″ x 12″ and a 31″ x 31″ work area, respectively. Zippy Robotics’ Prometheus is a milling machine that rapidly produces prototype PCBs from your desk in minutes, so you no longer have to wait weeks for a delivery truck. It works by carving through the copper layer of a standard copper-clad board (FR-4 or FR-1), as well as drilling holes and routing the shape of the board itself if it needs to fit a specific enclosure. Prometheus boasts an extremely low runout error that cuts traces down to .007 inches in diameter, meaning you can design with pretty much any surface mount component. Born out of their own frustrations with traditional fabrication processes, Voltera has come up with a unique way to reduce development time from months to days. Winner of both TechCrunch’s Hardware Battlefield and the 2015 James Dyson Award, the V-One can print out circuit boards, dispense solder paste and reflow. Voxel8, in partnership with Autodesk, introduced the world’s first 3D printer for electronics ranging from fully-functional drones to hearing aids. Designers and engineers will now be able to actualize three-dimensional parts with embedded circuitry for the first time. A perfect example of an idea that has gone from the ‘MakerSpace to MarketPlace,’ the PanakeBot is exactly what it sounds like: an automated appliance that can whip up pancakes in virtually any shape you can imagine. A team of MIT researchers has opened up a new frontier in 3D printing: the ability to build optically transparent glass objects. The G3DP consists of two heated chambers. The upper chamber is a crucible kiln that operates at a temperature of around 1900°F, and funnels the molten material through an alumina-zircon-silica nozzle, while the bottom chamber works to anneal the structures. There are 3D printers. There are engravers. There are CNC mills. However, BoXZY is different — it’s all three. Hoping to usher in a new age of ‘modular manufacturing,’ this triple-threat mini FabLab empowers Makers to alternate between the tools with quick-change heads. Oh, and did we mention that Justin and Joel Johnson raised more than $1.1M on Kickstarter? Instead of having to run out to your local package store or brewery, Pico allows you to craft fresh, personalized beer right from home. One notable feature of the coffeemaker-sized appliance is its new PicoPak system, which includes conveniently pre-packaged ingredient combinations. 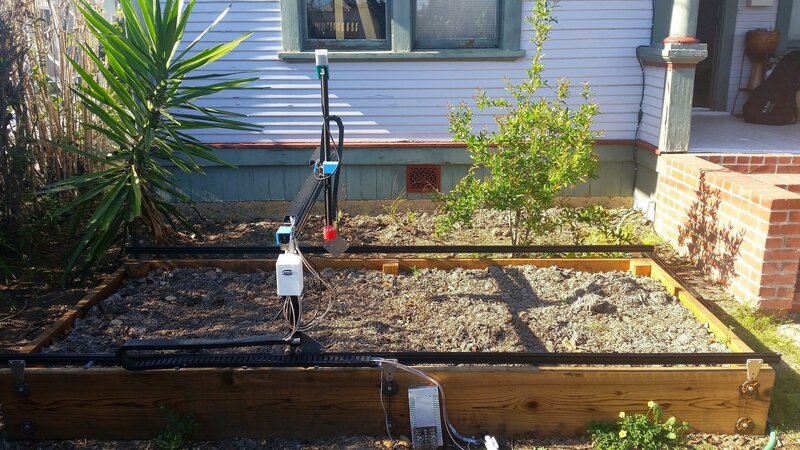 A finalist in this year’s Hackaday Prize, FarmBot is an open source CNC farming machine capable of weeding, seeding, feeding and watering crops. What’s more, its web-based application lets growers graphically design their farm or garden to meet desired specifications. This makes the process as simple as playing a game of FarmVille. The Ripple Maker leverages 3D printing and inkjet technologies to adorn the top of your morning latte with complex artwork that could take the form of someone’s name, their face, or even a personalized message to the customer behind you. The unit itself is rather small, measuring just 8.5″ by 10.5″, and connects via Wi-Fi to a library of designs. Users have the option to choose from a menu of themes and text to stamp onto the milky foam canvas with natural coffee extract. Bistrobot wants you to bid farewell to long lines and wrong orders, and say hello to an automated assembly line that can make peanut butter sandwiches on white bread with your choice of honey, blackberry jam, sweet chili, chocolate sauce and Nutella. What if you could design ready-to-wear garments straight from your desktop? Thanks to Electroloom, you can. The team’s electrospinning process makes it possible for anyone with a small bit of CAD ability to create seamless fabric items on demand. The artist duo of Varvara Guljajeva and Mar Canet has devised an open source, automated circular knitter dubbed Circular Knitic. In true Maker fashion, the idea was brought to life with 3D printing, laser cutting, MakerBeam and Arduino. Like a Keurig for cocktails, the Bartesian is a capsule-based gadget that enables anyone to expertly fix their favorite alcoholic beverages in a matter of seconds. Geared towards everyone from the DIY community to the industrial-savvy crowd, Evo-One is a sleek desktop CNC mill that can engrave, carve and cut complex shapes with incredible accuracy. This entry was posted in Maker Movement and tagged 3D Printing, Bartesian, Bistrobot, Chalkaat, CNC machine, CNC Mill, Electroloom, Evo-One, FarmBot, G3DP, Glowforge, PancakeBot, Prometheus, Shapeoko 3, V-One, Voltera, Voxel8, X-Carve on December 28, 2015 by The Atmel Team. A ready-to-run CNC machine made for anyone. The desktop fabrication revolution is well underway, and joining the likes of several other impressive gadgety is Evo-One. The brainchild of MakerDreams, this sleek desktop 2.5D and 3D CNC milling machine lets you engrave, carve and cut very complex shapes with incredible precision on different kinds of materials like wood, plastic and metal. With the burgeoning DIY movement in mind, Evo-One has been designed for everyone — from hobbyists to fab lab workers, and everyone in between. Its acrylic enclosure allows the machine to be used inside any room, garage or office, with no worries about dust or noise. According to the Italian startup, you can bring your idea to life in just three simple steps: draw your project, select the material, and then let Evo-One’s open source software guide you through the process. “Evo-One will create your project directly on the chosen material, letting you make a prototype, create or produce any item directly on your table. It will be like having a small mechanic’s workshop always with you,” the team explains. Evo-One is said to work on everything from various plastics (acrylic, PVC, polyethylene, HDPE, Corian and Delrin), to woods (maple, mahogany, walnut, pine, MDF, plywood, balsa and cork) to some metals (aluminum, copper, brass, silver and gold). It can even be used on several composites such as circuit boards, glass fiber, carbon, linoleum, wax and foam. Among its most notable features include an auto-zero touch plate and an emergency stop remote. Evo-One has a 14.5” x 8.6” x 4.7” (370mm x 2200mm x 120mm) working area along with a powerful spindle. This spindle is a single aluminum block with five ball bearings and a motor that cranks from 3,000 to 22,000 RPM with support for mills from 1mm to 7mm. Aside from that, the Arduino (ATmega328)-based device is equipped with a cooling fan for its upper part, a speed controller and some LEDs that illuminate inside. Evo-One’s Cre-Mov software been created in order to execute any G-code and control your CNC mill in an intuitive way, all while previewing the process in real-time on your PC. Sound like a desktop thingamajig for you? Head over to the Evo-One’s Kickstarter page, where MakerDreams has already well surpassed its $65,432 goal. Delivery is expected to get underway sometime this summer. This entry was posted in Maker Movement and tagged CNC machine, CNC Mill, Evo-One, Evo-One CNC Mill, Kickstarter, MakerDreams on December 10, 2015 by The Atmel Team. FarmBot is an open source CNC farming machine and software package designed for small-scale precision food production. A finalist in this year’s Hackaday Prize, FarmBot is a perfect example of how the DIY Movement can make a long and ever-lasting impact on our world. The brainchild of Rory Aronson, the project is an open source CNC farming machine that hopes to make an open food future more accessible to everyone. Essentially, FarmBot is like a giant 3D printer that, but instead of extruding plastic, uses seeds and water to grow crops. Similar to 3D printers and CNC mills, FarmBot hardware employs linear guides in the X, Y, and Z directions, which allows for tooling such as seed injectors, watering nozzles, sensors, and weed removal equipment to be precisely positioned. Not unlike many RepRap printers available today, FarmBot is controlled by the Arduino Mega (ATmega2560)/RAMPS stack, along with an Internet-connected Raspberry Pi 2, NEMA 17 motors and rotary encoders. The open source device can cultivate a variety of crops all in same area at the same time, and can impressively care for each one in an optimized, automated manner. According to Aronson, the outdoor XYZ unit can be constructed to fit each owner’s individual needs. It can scale from a garden as small as one square meter to as large as a farm that’s 20 square meters. In terms of cost, the Maker estimates a FarmBot to run anywhere from $1,500 to $4,000, depending on the size of the installation. And since it’s comprised of corrosion-resistant aluminum, stainlees steel and 3D-printed plastic components, it’ll withstand Mother Nature for years. Using the web-based app, a user can graphically design their farm or garden to their desired specifications and then synchronize the numerical control code with its embedded hardware. With its sequence builder and scheduler, FarmBot combines the most basic operations in custom sequences for seeding and watering, and even enables you to build complete regimens for the plant throughout its lifetime. 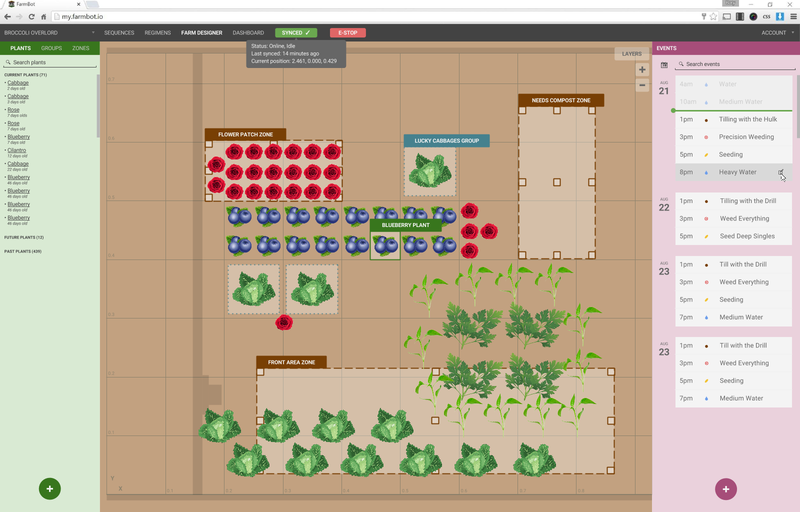 What’s more, a drag-and-drop interface lets users graphically design the plant layout in a game-like environment similar to FarmVille. Aside from that, additional features of its software include storing and manipulating data maps, accessing an open plant data repository, and real-time control and logging. Moreover, an integrated decision support system can automatically adjust water, fertilizer and pesticide regimens, as well as handle seed spacing and timing based on soil and weather conditions, sensor data, location and the time of year. Looking ahead, the team is experimenting with sensors, drills and a camera tool, and more importantly, hopes to expand its community of hackers and DIY food enthusiasts interested in developing the platform. FarmBot will come in two different kits, Genesis and Genesis XL, 1.5 meters by 3 meters and 3 meters by 6 meters, respectively. The latter will be capable of growing four times the amount of food as its smaller sibling. Both models can be used outdoors, inside a greenhouse or even on a rooftop. Intrigued? Head over to the project’s page on Hackaday here, or watch its overview video below! 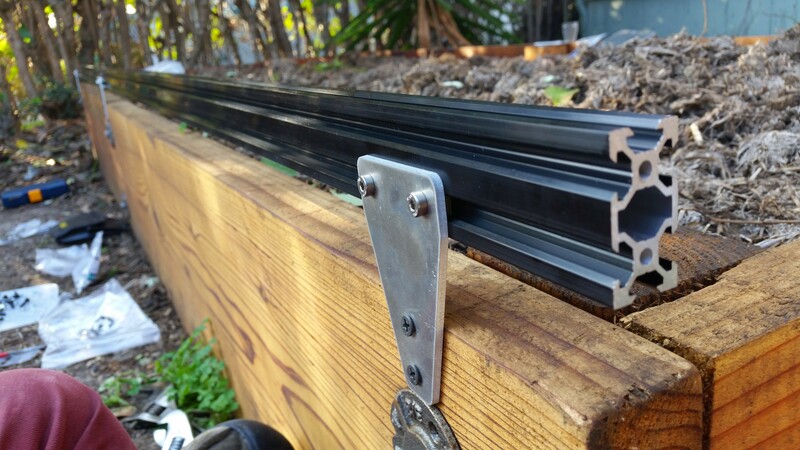 This entry was posted in Maker Movement and tagged Arduino, Arduino MEGA, ATmega2560, CNC machine, CNC Mill, FarmBot, Open Source CNC Machine, Open Source Farming, Raspberry Pi 2 on October 26, 2015 by The Atmel Team. 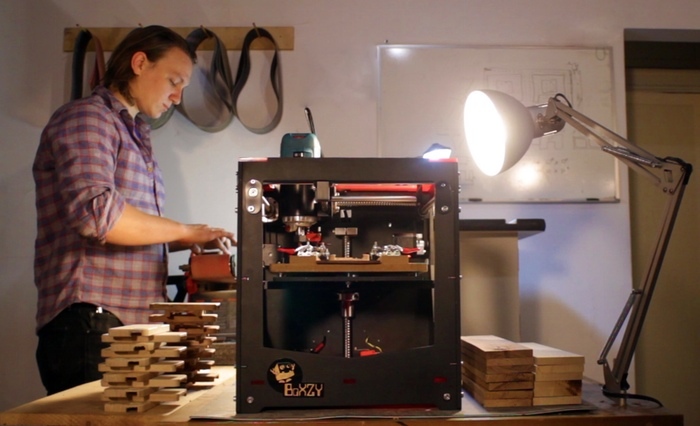 BoXZY is an all-in-one CNC mill, laser engraver and 3D printer. We’ve seen plenty of 3D printers. We’ve seen a number of CNC mills. We’ve seen countless laser engravers. Yet, a combination of all three is a much rarer sight. Developed by two brothers from Pittsburgh, Joel and Justin Johnson, their recently-revealed machine is shaping up to be a multi-purpose masterpiece that will appeal to both beginners and experienced Makers alike. The BoXZY has been developed to serve as a complete desktop manufacturing space, rather than just a 3D printer with some additional options. “We refer to it as a desktop manufacturing space. While the system is user friendly, its capabilities are much more precise than consumer models currently on the market. But the key differentiator for BoXZY is its interchangeability,” the duo explains. In essence, BoXZY is a dual-extruder FDM 3D printer that can be quickly interchanged with a solid 1¼ horsepower Makita router, transforming the machine into a powerful CNC mill or a laser etcher in a moments notice. Using these heads, any Maker can craft a block of aluminum, hardwood or plastic into more complex designs. The whole operation is housed inside a solid aluminum body, and assembled with stainless steel hardware to ensure its stability and durability throughout all applications. Moreover, the triple-threat tool is designed to be completely modular and hackable — something Makers of any level will appreciate. To power up and create its four micron resolution, BoXZY drives all three axes with industrial ballscrews, which are firmly situated in its sleek, black anodized aluminum body. As a CNC mill, BoXZY can handle intricate shapes in all kinds of materials. 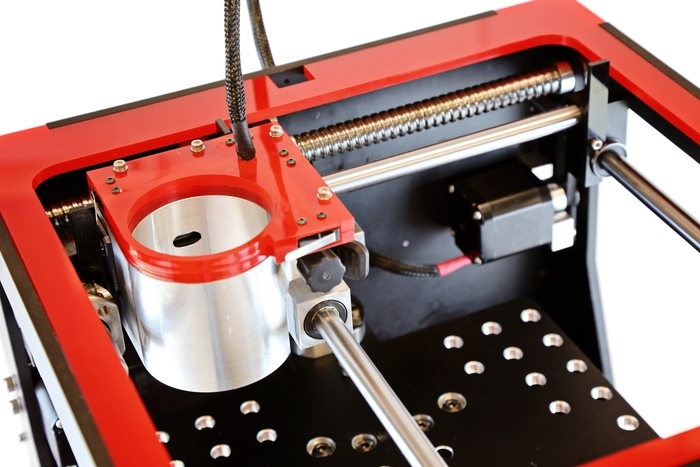 To get started, users simply pull off the magnetically coupled 3D print platform to expose the pre-drilled fixture plate and attach their spoil board, fixture plate or clamps. Additionally, BoXZY boasts a 2000mW laser engraver that slices through balsa and other thin woods eagerly, and will put finishing touches on hardwood, leather and plastic with incredible precision. And when it comes to 3D printing, BoXZY is billed as a top-tier device as it complements its mill and laser perfectly. Indeed, Makers can easily and accurately print complex shapes with fine detail using a wide-range of filaments like PLA, ABS, PVA, Ninja-flex, ABS, and even nylon. All together, anyone can now devise shapes that would have otherwise been impossible from other forms of manufacturing. What’s more, Makers can CNC mill, laser engrave and 3D print without ever leaving the control software. That’s because BoXZY utilizes a simple, intuitive interface that caters to everyone from novices to pros. For milling, BoXZY uses AutoDesk’s 123D toolpath generation, and can execute G-code created by most commercial CAM programs. Interested? Head over to its Kickstarter campaign, where the duo is currently seeking $50,000. If all goes well, units will begin shipping in November 2015. This entry was posted in 3D Printing, Maker Movement and tagged 3D printer, 3D Printing, All-in-One 3D Printer, BoXZY, CNC, CNC Mill, Kickstarter, Laser Engraver, Makers on March 12, 2015 by The Atmel Team.